These words struck Paul so sharply that he literally fell into unconsciousness on the floor! A doctor tended to him and Paul was able to rejoin the service and remained until the end. Other congregants thought he fainted due to excessive standing when in fact, it was his realization that the rejection of Christ by the Jews as the promised Messiah that left him reeling with the knowledge that he, too, lived with the same rejection and his heart was soon converted to the true faith. Paul’s conversion began with three dreams in which the Lord appeared to him. In the first dream, Paul saw three words on a piece of parchment, Faith, Freedom, and Nation. The Lord then appeared to Paul and produced a photo with 360 people in it, and He instructed Paul “to repent for the sins of your fathers, which was My Crucifixion.” After showing Paul the holes in His hands, the Lord disappeared. It was Holy Thursday, about two months later, when Paul had his second vision of the Lord. Paul saw his family that was exterminated in Germany and they were enjoying a meal together when there came a knock on the door. It was a postal carrier with a letter for Paul. Along with the letter there was the same photo of 360 people that Paul had seen in his first vision. 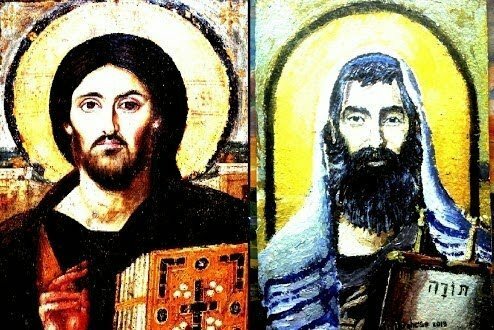 Suddenly, Paul heard a voice instructing him to “take your family and come with Me… repent and come with Me to be saved.” After that, Paul’s faith was so inflamed that he entreated his family to join him in going to Metropolitan Seraphim for baptism and catechesis. Paul immediately awoke and told his wife and family of his vision. He instructed them to watch and not be shaken by anything, even the offering of money which would come the next day. The entire Community Council would appear at Paul’s home offering him huge sums of money to convince him to return to the synagogue. But as instructed by the Lord, Paul stood firm and instead contacted Metropolitan Seraphim to baptize him and his family. On Sunday, June 8th , 1952, the day of Pentecost in the Orthodox Church, Paul and his family were joyfully received into the sacrament of baptism as was witnessed by nearly three thousand people.